One thing I have believed for quite some time is that the banking system has been denying gold miners and gold investors true price discovery for gold and silver bullion. And although the Gold AntiTrust Action Committee has provided proof of it, I stopped preaching this sermon a long time ago because those who believe will believe and those who won’t keep an open mind simply reject it. But one of the most compelling arguments for those to believe paper market activity essentially rigs the gold price is this chart, which I showed in my presentation at the Metals Investor Forum last weekend. This chart dates back to 1970, or just a few months prior to August 15, 1971, when President Nixon closed the gold window such that the price of gold began to float freely from its $35 per ounce peg. The red line (middle line) is the historical LBM AM Fix price. The current price of gold is right around $1,200. The red line is the price that gets quoted every day and what mining companies are paid for their production. But it is a very dishonest price because it is a paper market, not a market for physical gold bullion. Currency can be and is created out of thin air by the banking system, and traders who live in that world are free to play games in manipulating the gold price. Now if you scoff at the idea of market manipulation, I want you to help me understand how there is such enormous divergence between the blue line (line that moves from lower left to upper right) and the black line that moves from upper left to lower right. Let me explain what these lines represent. 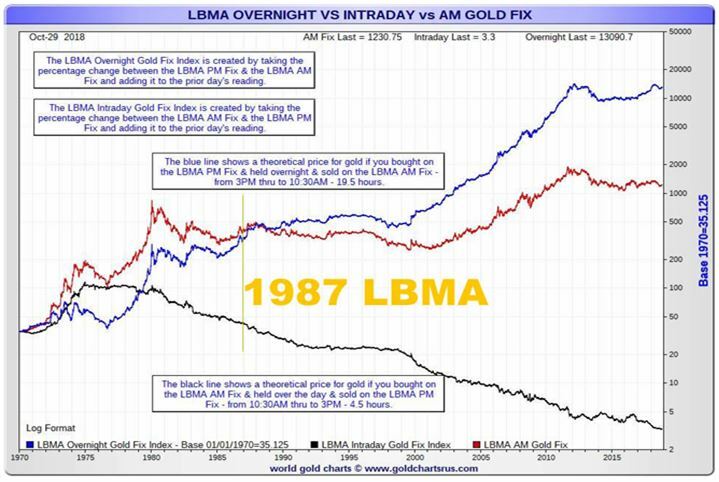 The blue line shows a theoretical price for gold if, every day you bought gold on the LBMA at the PM Fix, held it overnight then sold it on the LBMA at the AM Fix. In other words, you would have held it 19.5 hours from 3:00 p.m. on the day of purchase to 10:30 a.m. the following day when you sold it at the AM Fix. The data points for the overnight gold fix index are calculated by taking the percentage change each day between the price purchased at the PM Fix and then selling it the next morning at the AM Fix. The outcome is absolutely amazing! On the logarithmic chart shown above, the $35 paper gold value just prior to 1971 would have grown to over $13,000 this year! By contrast, the black line, which represents the Intra Day Gold Fix where you buy gold at the AM Fix and sell it at the PM Fix the same day, shows an unbelievable contrast. Each daily point is calculated by taking the percentage change between the LBMA AM Fix and the LBMA PM Fix and adding it to the prior day’s reading. In other words, you would be holding your paper gold 4.5 hours each day from 10:30 a.m. through 3:00 p.m. The cumulative outcome of that trade every day would result in your $35 initial purchase before Nixon defaulted on the U.S. obligation under Bretton Woods in 1971 to just $3.30 during the summer of this year. When I saw this chart, even though I have believed the gold markets have been suppressed by the U.S. since the end of World War II, I found the magnitude of difference hard to believe. So, with the help of my assistant, Claudio Bassi, who downloaded historical AM and PM Fix numbers, I ran the numbers and found they are absolutely correct. So here is my question to you naysayers who don’t believe the banking system is protecting its counterfeiting activity by rigging the gold markets. 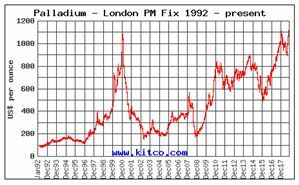 Please explain to me how buying paper gold on the PM Fix and selling it on the AM Fix the next day can differ so widely from the quoted price? How is it possible that the current price of gold of around $1,200 contrasts with a gain of $13,000, or more than tenfold, since 1971? How can it be that skimming profits every day by buying the PM Fix and selling the AM Fix the next day possible if the LBMA paper market isn’t rigged? Also, how, if the markets are free, can making the opposite trade end up causing a loss of 90% over the years? My friend David Jensen brought to my attention that the pretend game played by the bankers may indeed be coming to an end. David pointed out that palladium not only hit a new high this week but that rates to borrow it in the short term are rising very dramatically, indicating a shortage of physical metal. With no limit to fiat money creation, an infinite number of contracts to buy a metal can be created. But what happens when automakers and others demand delivery of the metal when there isn’t enough metal to go around? Unlike gold, metals that are used for industry, like palladium and platinum and to a lesser extent silver, eventually have to be delivered. Fantasy metal in the form of paper won’t cut it. The main sources of palladium are Russia and South Africa. Why the shortage now? Might it have something to do with growing geopolitical tensions between Russia and the U.S.? I don’t know but I’m taking a serious look at North American Palladium (Toronto-PDL) because it is starting to move. It rose $1.55 on Friday to $12.55.